America has been stumbling for quite some time due to its lack of adaptation to a changing world. The classes are separating again (as they always do when there’s no catastrophe), we’re about to lose even more jobs to automation and AI, and it’s becoming increasingly difficult for average Americans to afford basic items like rent, healthcare, education, and retirement. 40% of Americans can’t cover a $400 emergency expense without selling something or borrowing money. Making things far worse is the fact that the political conversation has massively polarized, with collective insanity accumulating on both the left and the right, leaving very little ground for any moderates or centrists. A lot of people think once the current president is removed or leaves, we’ll just go back no normal, but that’s foolish. The exact same forces and pressures that brought him in are still there, and if anything they’re looking to double down on their positions. What the centrists like you and me need to realize is that the idiodic right is powered by the insanity of the left, and vice versa. The extremes are destroying our a ability to talk to each other, and therefore are destroying the country itself. The country is not doing well in a basic health sense, e.g., our infrastructure is failing, our education is getting worse, the classes are separating, our consumer debt continues to rise, etc. We’re politically more divided than ever, and the two extremes are blaming each other with a shrinking and silent center caught in the middle. The alternative to this is to have the Democrats nominate someone boring and unremarkable, and either get a second term or someone even worse from the right. But there’s a solution. And I think it may be the only one. America needs a radical centrist who will push innovation and core principles without apology. We essentially need someone who’s willing to be just as aggressive and loud as a Trump / GOP character, but who will do so with goals that are aligned to America and the American people. I’m not saying these are ideal choices. I’m saying we’re out of options and drastic action is needed. A vocal scientist, like Neil deGrasse Tyson, who will be logical and efficient in how they address prioritization of problems. And who will hopefully have some measure of resistance to the corrupting nature of politics. A popular personality, like George Clooney or Matthew McConaughey, who will walk down a centrist path in a way that most Americans can follow. 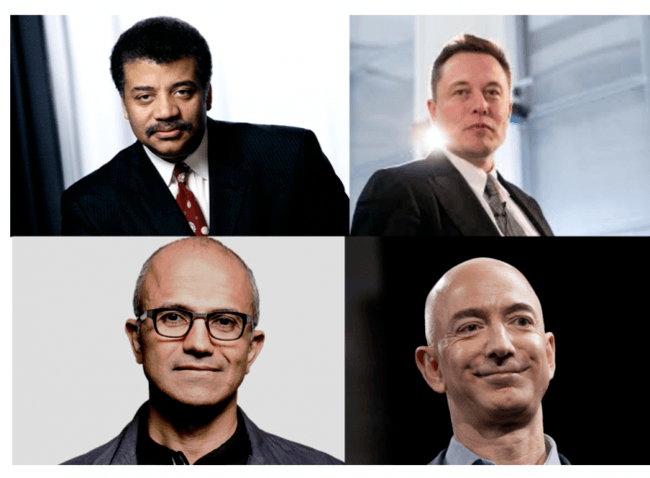 An innovator, like Elon Musk or Jeff Bezos, who can aggressively push a visionary agenda without being seduced by popularity contests or monetary enticements. Getting an actor would make me sad, but could work. A scientist would be amazing, but I worry they’d be out of their league and quickly devoured. Which leaves our best option as a type-A innovator type. So what should the message be for Jeff Bezos as President? It will need to do three things simultaneously. Have clear and aggressive bullet-point goals and principles. We can’t have a candidate who’s simply against other things. They need to be about something themselves. They have to rhetorically neutralize the Extreme Right. They have to rhetorically neutralize the Extreme Left. Here’s how I see the platform rhetoric that does all these simultaneously. America is not a geographical location. It is an idea that has core values that we insist on upholding. We understand you like the opportunity here, or maybe your family has lived here for many generations, but if you don’t accept these principles you should find somewhere else to go. People are allowed to be themselves, whether that’s heterosexual, homosexual, bisexual, transgender, or some combination thereof. If you claim to be a proponent of freedom, start with letting people be who they want to be and minding your own business. Women are people, and people are individuals. Group differences between men and women cannot tell you anything about an individual’s capabilities or preferences within those groups. So you can both accept group differences and still treat everyone the same. In fact we insist on it. Show the rich that we’re not against them. It’s ok for people to have lots of money, especially when they have worked very hard or very long to achieve that success. Show the liberals that we’re with them as well. It’s not ok for people working very hard at the bottom, playing by all the rules, to be unable to afford rent, healthcare, education for their kids, and retirement for the future. There are forces, both in the government and in the private sector, that are causing this, and they need to be directly addressed. Show the conservatives that we know a culture of hard work matters. The cultures within America that emphasize grit and self-sacrifice to get an advanced education are those that are thriving, and those that don’t emphasize education or long-term aspirational goals are those who will suffer. We must both accept this and get as many people as possible to see the difference and strive for the former. Defuse racial tension by letting white people enjoy their heritage like everyone else. White people hereby have permission to be proud of their heritage. People of European descent have done some spectacular things in the world, and we owe much of our current advancement to those innovations. Great job, guys. So now every ethnicity is officially allowed to be proud of who they are. Now let’s stop talking about it. We are not races—we are Americans! Celebrate your kindness and your innovation, not the color of your skin. Shame the racists and Nazis, and demonstrate that doing so is American. America defeated Nazism in the 40s, and it was a high point for our nation. We defeated Nazism because it is based in racism and hatred. If you are a direct proponent of racism and hatred, then you should leave. There is no place for white supremacy, white nationalism, Nazism, or any similar ideology here. We’ll pay for your ticket to move your entire family, starting today, and we’ll revoke your citizenship on the way out. You are not wanted in America. Illustrate that both sides have merit. Most police are great citizens and are doing their jobs at protecting all of us. There is a small segment of police, which is far too large, that are extremely racist and aggressive towards Black people and this will hereby be aggressively diagnosed and treated, like the cancer that it is. And we will protect and celebrate the model majority in the meantime. Address these ridiculous college movements. Free speech is a democratic scaffold that cannot be attacked or diminished. People should be, and will be, allowed to express all manner of opinions that are not direct incitements to violence. If an idea is truly stupid, or truly evil, let the light of scrutiny and discussion destroy it rather than sending it to a dark damp basement to fester and mutate. Universities should exemplify this approach. Hard no on extremist religions. Finally, if you are part of a political party or religion that has racism, the denigration of women, or hatred for alternative sexual lifestyles as a central component, then that ideology or religion is not compatible with America. And neither are you. Pick a side, and embrace your decision by abandoning old-world bigotry or by finding another place to live. If only the rich are educated then we have failed as a country. If good teachers have to find other jobs in order to make money, we have failed as a country. And if we are not among the top 5 most educated countries in the world, we have failed as a country. We’ll start this journey by redirecting 1 trillion dollars in 2021 from the military budget to go directly into teacher salaries. This way we can keep the best people doing what they love and what the country needs. If you have ideological compatibility with America (see above), and you are industrious, educated, skilled, hungry for success, or otherwise ready to come here and work hard to thrive, then we welcome you. We care not what you look like, what food you like to eat, or what language you speak. You will be welcomed as a future American. If you’ve here illegally but have been working hard for a long time we’re going to bring you into the formal process towards citizenship. If you’re here illegally and have been a criminal or a parasite, you are being deported. There will be no wall, because 1) it’s a stupid idea, and 2) it will not be necessary. We will control immigration by enforcing existing laws and holding businesses accountable for their decisions. America itself is an experiment, and one we’re quite proud of. And we believe in being exceptional. We are the inventors of so many of the advancements we have today, and we intend for that to continue. We will do that starting here in our own country, with its infrastructure. We will have the best healthcare, the best roads, the cleanest air, the most advanced cities, and the most innovative research and development in the entire world. And anyone in the world can come here, apply to become and American, and participate in the opportunity. It is America’s time. Not the old America, where only the white people were happy because everyone else was invisible or worse. And not a new America where white people are disregarded or pushed aside. This America is for everyone, and it has no color. We are about principles. Equality, kindness, and innovation. And we will work with the world to be a citizen of the planet. If you’re tired of this country being destroyed by the right, destroyed by the left, and spat upon by everyone who sees its flaws, then we’re looking for your support. America has more potential than any country in the world, and by using this common-sense, centrist approach we’re going to ignore the political fringes that insist on living in the past and blaming others. Well that was fun to write. I’m sure it needs to be added to, fixed, cleaned up, whatever. But if you have any ideas on what else should be in the platform, let me know. What I like about it is that liberals will think I’m conservative, and conservatives will think I’m liberal. And I guess they’re both correct. That’s kind of the point. I’m neither and both, just as the country should be. I am thinking about seriously floating it to some people who might be able to use it somehow. We know for sure that what we’re doing now, and what the Democrats are likely to offer, will only take us farther astray. So we have to try something, and I think this our best bet.